Ideal for a relaxing and affordable holiday in Puglia for those who enjoy the sun and sea. Near the beautiful beach of Torre Guaceto, a WWF natural reserve and a protected sea area (see photo). The Villa is built on a 9000 sqm plot of land which is entirely fenced in with vast gardens and lawns and a beautiful swimming pool open from May until half October. 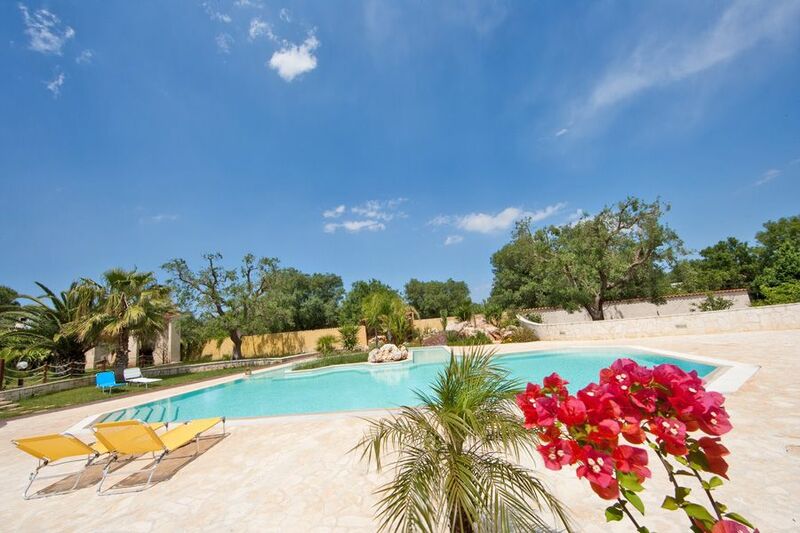 The pool is of exclusive use for the guests of two villa that belong to the estate. Around the swimming pool there are different spaces: rock garden, green grass around an olive tree, solarium, with trani’s store floor, a wooden gazebo, chairs and sun-beds. The Estate is formed by another flat, available seperately. All two flats, when rented together, sleep 12. This characteristic makes it perfect to accommodate also 2 or 3 families. Visit the personal site or other homeliday reference number 6173682 with excellent testimonials. LAST MINUTE: IF YOU BOOK 15 DAYS IN ADVANCE, THERE IS A 20% DISCOUNT. It’s approximately 20 km in the North of Brindisi and 80 km in the south of Bari. For those who are coming from Bari, drive to the motorway E55 Bari-Brindisi direction Brindisi. After approximately 80 Km from Bari, exit to Serranova - Torre Guaceto and continue to the village of Serranova that is 5 Km far from the motorway. For those who are coming from Lecce or Brindisi, drive to the motorway E55 Brindisi-Bari direction Bari. After approximately 20 Km from Brindisi, exit to Serranova - Torre Guaceto and continue to the village of Serranova that is 5 Km far from the motorway. The main train stations are Ostuni and Brindisi, distant both approximately 25 Km. Typical landscapes of the area such as the “trulli” in Alberobello, the white city of Ostuni, the Castellana caves, the safari-zoo in Fasano and other characteristic places in Salento like Lecce, Otranto and Gallipoli are all within driving distance. The house is ideal for the sun and sea by day and typical streets and festivals in Salento by night.